Plants require the proper environmental conditions for optimal growth and health. If the mixture of temperature, humidity and light are incorrect, fruit and vegetable yield can be affected. Monnit can help you monitor and maintain the optimal mix of environmental conditions for plant growth. 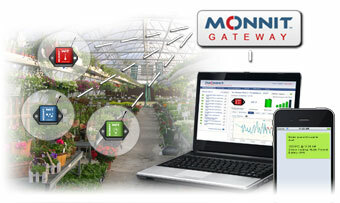 With Monnit wireless temperature sensors, humidity sensors and light sensors, you can have 24/7 monitoring of your agricultural greenhouses and have the ability to track environmental changes, allowing you to maximize your energy efficiency and grow healthier crops with a higher yield. Increase Your Crop Yields with Monnit Wireless Sensors! Monnit has created a custom sensor notification that is frequently used in commercial refrigeration monitoring. This custom notification, allows you to receive an alert when the temperature has changed for a set amount of time instead of sending the alert based on a single reading. This helps prevent false alerts in commercial refrigeration applications. In order to use this custom alert, we need to make sure that the “Aware State” settings are correct on the temperature sensor(s) we will be using. To set the “Aware State” settings, click on the name of the temperature sensor in the sensor list then click the “Edit” tab, or simply click the pencil icon next to the sensor name in the sensor list. From the sensor edit page, we need to make sure that the “Aware State” settings will work for our notification. For iMonnit Premiere accounts, you can set the aware state heartbeat to as quick as 10 minutes, if using the basic “free” monitoring, this defaults to your standard heartbeat. Next we need to set the “Use Aware State” setting. This is a threshold that is held in the sensors physical memory, triggering communication when it is met. For Premiere the sensor can hold a high and low threshold, for basic, the sensor will hold one threshold. 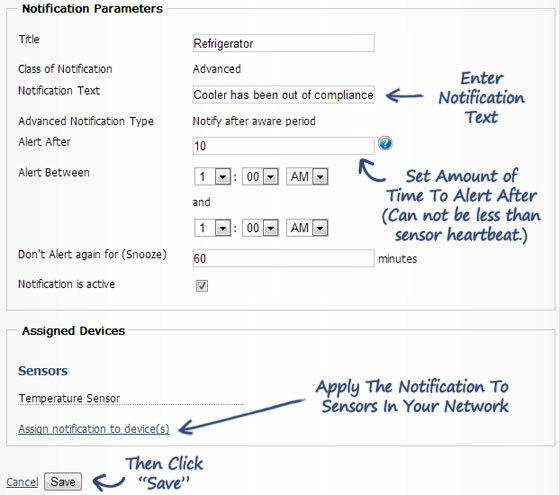 In order to setup a custom refrigeration notification, click on “Notifications” in the main navigation menu. From the notifications page, click “Create new notification” or the “+” button. In the “New Notification” setup window enter a name for the notification, select “Advanced” for the class of notification and “Notify after aware period” for the advanced notification, then click “Create”. On the next screen, enter the contact information for the alert recipient, then set the “notification parameters by entering your custom notification text and setting the “Alert After” time equal to your sensor’s heartbeat. If you want the notification to be active 24 hours a day, leave the “Alert Between” settings as is. Make sure that the notification is active, then assign the notification to your temperature sensor(s). When finished click “Save”. This notification will automatically use the settings from each of the assigned sensors, to let you know when the temperature has been above or below the individual sensors’ aware state threshold for the defined amount of time. If you are familiar with more Monnit sensor types, you realize that this notification can be used by several other sensor profiles. For instance, instead of being notified when a door is opened, be notified when a door is left open… there are a plethora of possibilities.